Results from our latest FenwayNation Poll show that the awkward in-flight confrontation between David Price and Dennis Eckersley was viewed as the top Red Sox news story of 2017. 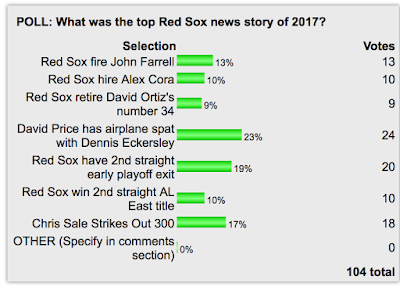 As the chart shows, nearly one-quarter of our readers (23%) chose The Price-Eck Dust-Up as the #1 story, followed by the second-straight early playoff exit by The Carmine Hose at 19%. Close behind in third spot was the 300-strikeout year of Chris Sale (17%), then the firing of manager John Farrell at 13% and the hiring of new manager Alex Cora at 10%. 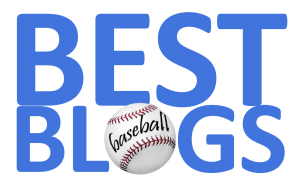 Also at 10% was the winning of a second straight AL East Title, while retiring David Ortiz's number came in (surprisingly) last at 9%. You can still vote HERE.